The photo shows the pond and meadow in the first growing season, the meadow is still germinating and developing… I will add further photos this next season 2018 as it matures. 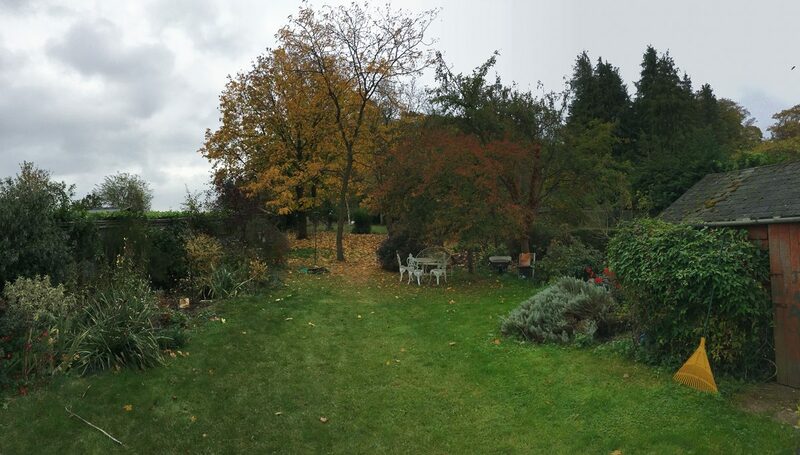 I was asked to work in the upper area of this long, thin and sloping garden in Bladon. 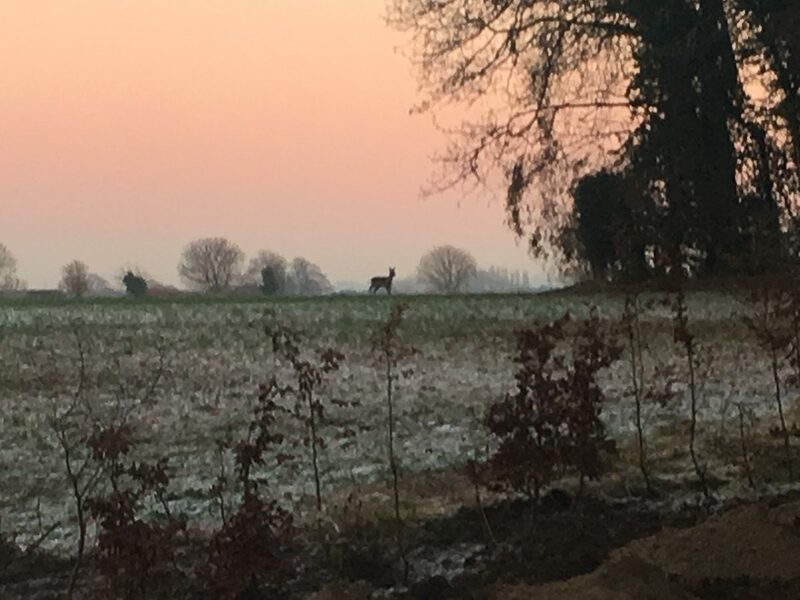 The site had fantastic views across the fields, various wildlife, and also many mature trees that added a lot of presence to the space but had to be worked around. 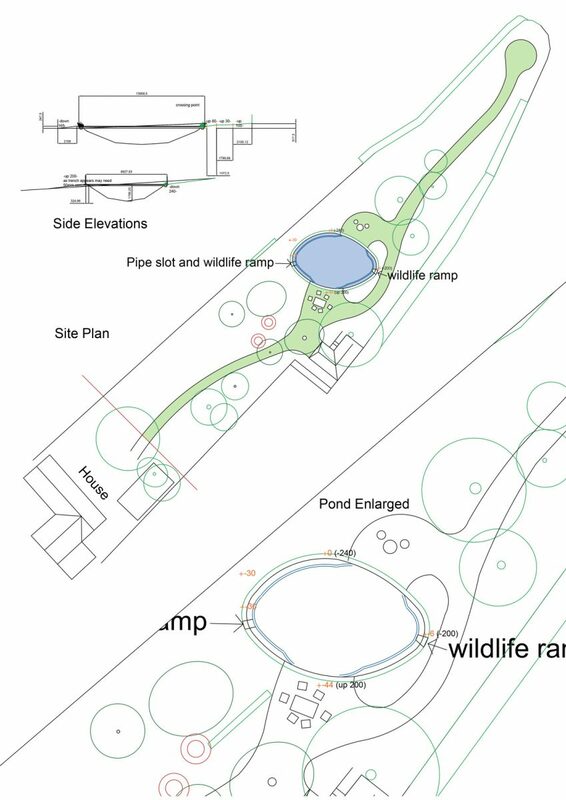 During the first meeting the client stated that she had been considering having a pond for some years. She also said that she was very interested in wildlife and wild spaces. I walked around the, surveying, photographing, selecting important views and getting a feel for space. 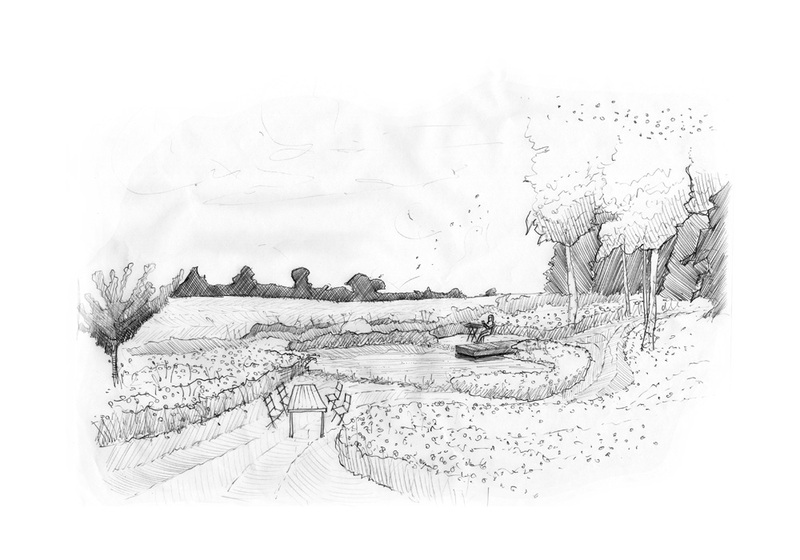 Having considered the site, and done some sketching, I decided that a pond would create a great centre point to this new garden, and if lower down in the space, it would be possible to see the sky reflected in the body of water. So I worked on the specific design of that form and its position. 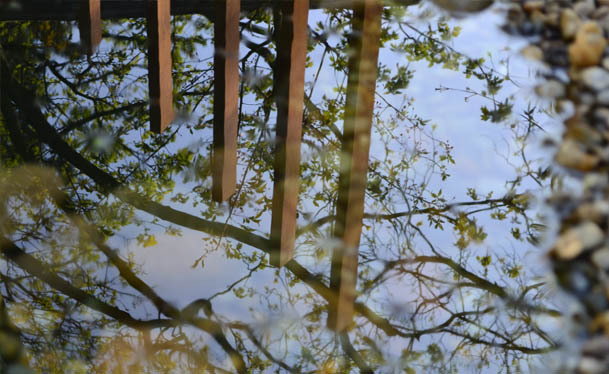 Wild Pond Shape – Something to be said about a wild pond shape is most of the time my main goal is to create a large reflective surface. I find an ellipse seems to work a lot of the time, because obviously when you look at an object in perspective it appears crushed so unless it has a has a large surface area, by the time you are walking up to it on the ground your not going to see much of a reflection. Also an ellipse is a lot less formal than a clean circle which feels better for a wild space. This site only had one view of the full sky, so orientating an ellipse to the view seemed a good way to start. A Wildflower Meadow – I felt like a wildflower meadow surrounding the wild pond would work well, partly because the clients had expressed a love of wildlife, partly because the client already had a formal garden around the house, and finally I feel there is a real beauty to a view made up of very simple elements, like a field of wheat and the sky. I thought it would be lovely to see an entire space filled with meadow, and then a single body of water reflecting the sky. One thing to consider when creating a wild flower meadow is that as the flowers decay from mid summer onwards the meadow can look dry and some people find this ‘messy’ looking as the meadow dries back. I personally feel the dead heads of the flowers, the dry umbels of wild carrot and the remaining grasses have their own beauty and I really like meadows at this time late summer/autumn time of year, but its important to not as a commercial designer that a wild space might not deliver enough year round interest to satisfy a client if for instance we implemented one directly around a house, and it might feel too loose for some people’s taste. 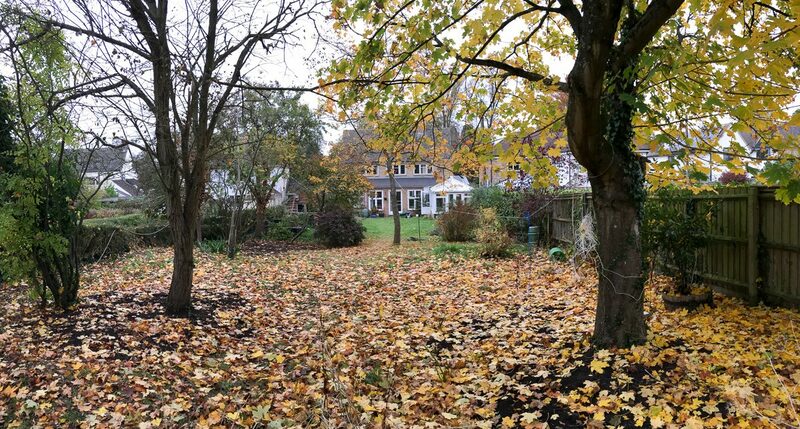 So a seperate space in a garden like this, which connects to the open landscape like this is perfect for it. Next I needed to decide how to access the pond and move through the space. I like a very informal pathway through a meadow, and a mown turf path does this very well, as it can be designed to be elegant, so it sweeps through a space, and it can be laid in turves, so it is easy to maintain from the beginning which is important because a meadow takes so long to grow, often developing in the second full season, so during this time, it is good to have a space which the client can walk through so they can watch the meadow as it grows without walking on the delicate juvenile plants. I wanted access to the pond from both sides because, the lower side when reached first from the house, would reveal the reflection, but the higher side felt like a nicer space to sit and have a tea, so I introduced a curved turf path that snaked through the space (hopefully elegantly) and met the pond on both side, offering two flexible spaces for chairs or tables, or a picnic blanket. 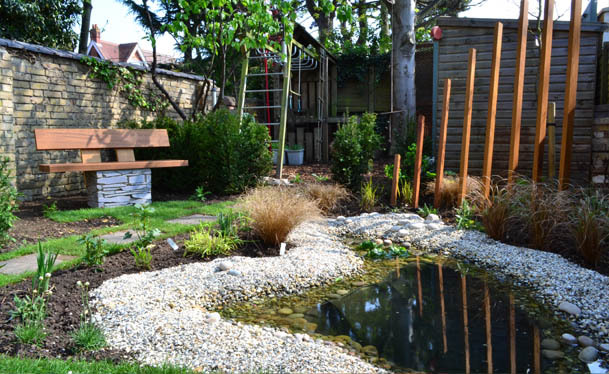 This entry was posted in Biodiversity, Garden Design and Build, Water features, Water Gardens, Wild Flower Meadows on March 16, 2018 . 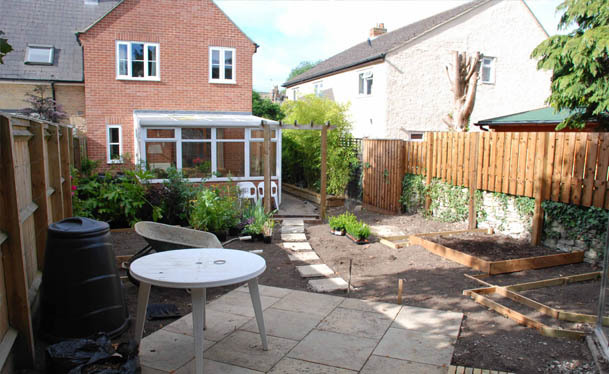 Here is a garden we built in Eynsham last year. 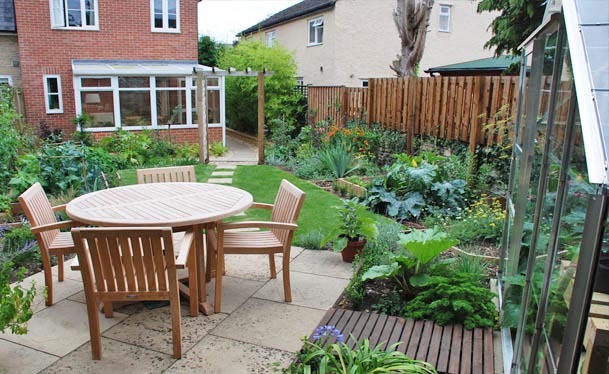 Our brief was to create a warm family garden for our client to enjoy with her grandchildren. The space was closed off before with a fence and two large conifers, this left it feeling cut off from the house. We wanted the client, a concerned grandmother to be able to explore and play with the children in the garden. 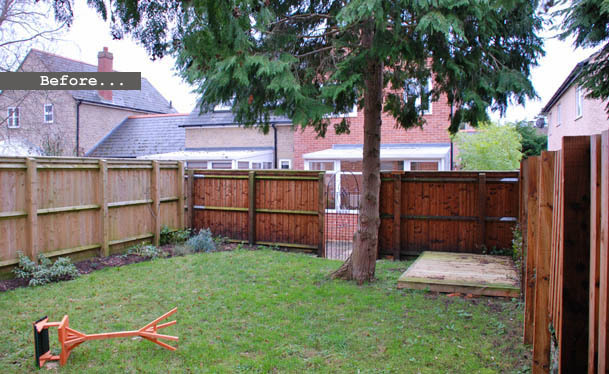 We felt that leaving the fence meant the client might not feel comfortable leaving the children to play in the space while not being able to see if they were ok from the house. Also the issue with restricted light from the trees made the space difficult to use. We decided to cut the trees and remove the fence. 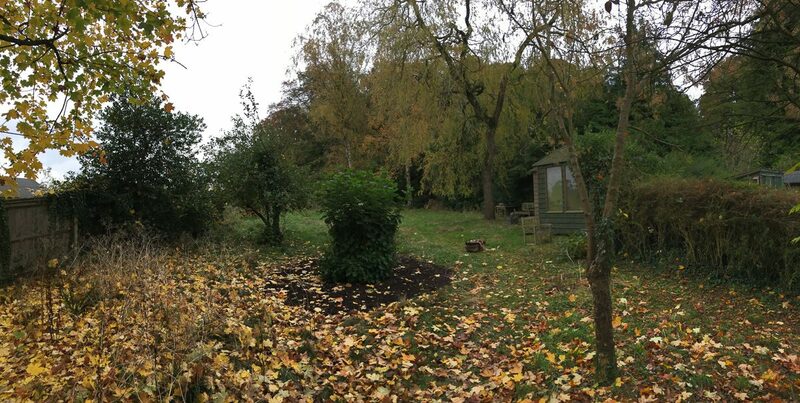 The client expressed an interest in growing vegetables, and we suggested adding perennial areas to soften and add colour which she accepted. 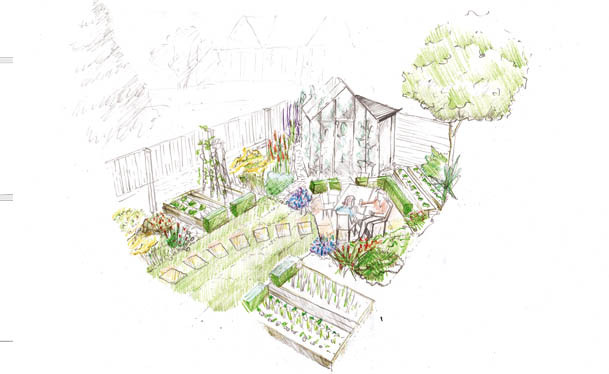 So we had several elements to add into our design: reusing materials on site, vegetable growing areas, perennial borders, a patio, a greenhouse, and shed. , we cut new slabs from old slabs to make small stepping stones across the lawn. 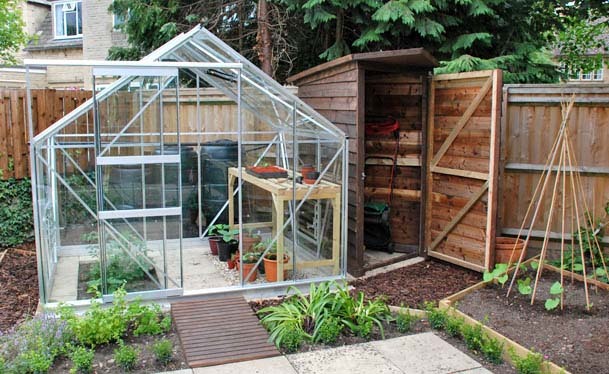 We reused the wood from the fence to make a new shed which fitted into a triangular space next to the greenhouse. 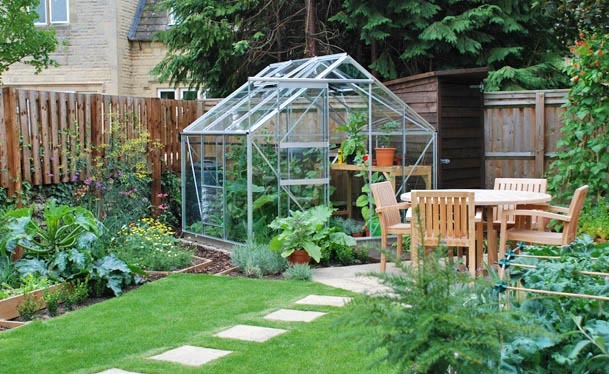 Primarily we took the greenhouse and made it a centre piece, ordering one which had the opposite proportions to the norm so the width of the front arched side, was equal to the side panels. 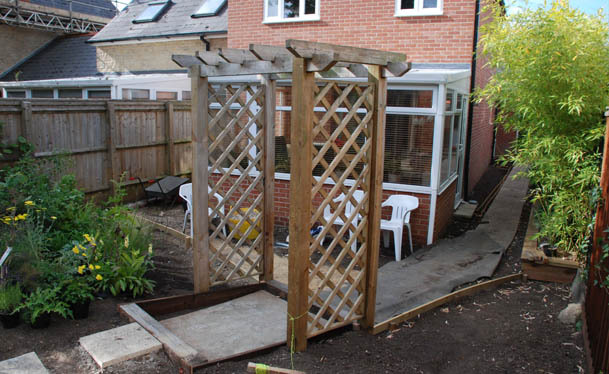 This meant we could turn the greenhouse into the space, and use the point of the roof as a focal point in the garden. 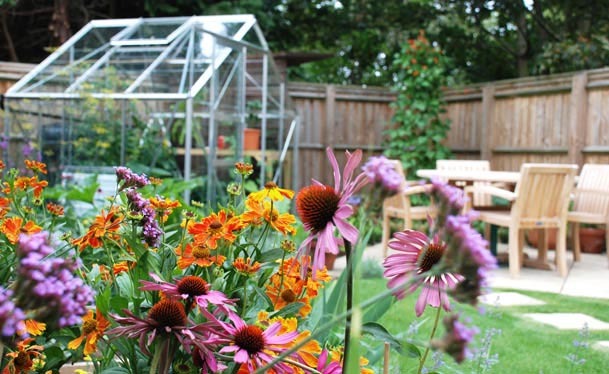 The idea was to mix up a cottage garden containing box hedging borders and perennials and a kitchen garden so the greenhouse became the vertical counterpoint to the patio, providing enclosure and a sense of shelter, while vegetable raised beds were also mixed up with perennial beds. It made sense to fit these elements together so they could compliment each other. I think this combining of working space and visually pleasing space, as well as reusing materials, allow this garden to feel contemporary, but also very homely. Here is what our client had to say about it. 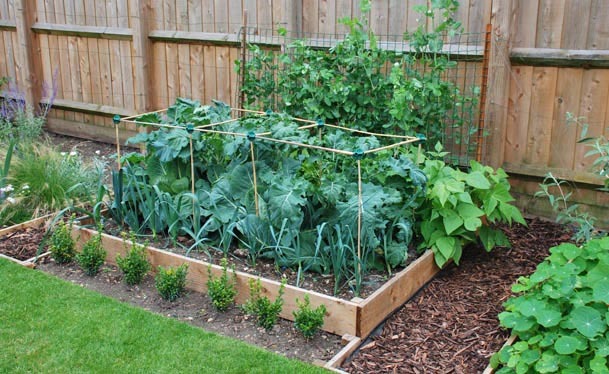 This entry was posted in Garden Design and Build, Kitchen Garden and tagged Garden Building Construction, Garden Design, Sustainability on April 14, 2014 . This picture shows a wildlife pond in summertown, with a sculpture behind supposed to reflect in the water and open up a dark space in the corner of the garden. When I say ‘Wildlife’ pond, to us it still means a pond which we created, but we didn’t add a filtering system, or other means to maintain it artificially (like chemicals), we made it deep enough to discourage algae, we added oxygenating plants, and we didn’t add fish to the pond. 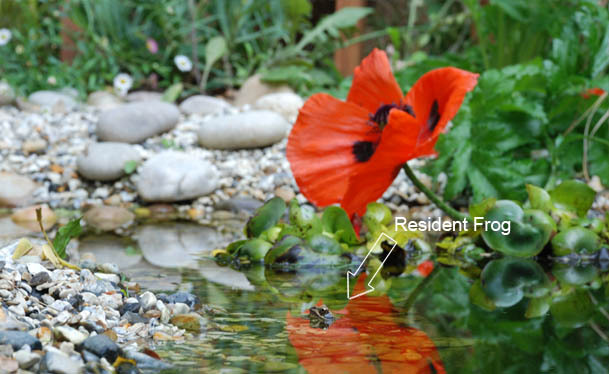 The pond has since become a haven for wildlife encouraging birds into the garden to drink, and having resident frogs, as well as being an insect habitat. This has allowed the family to enjoy their shared interest in British wildlife, in their own back yard. This entry was posted in Biodiversity, Sculpture, Water features, Water Gardens, Wild Flower Meadows and tagged Pond, Sculpture on June 14, 2011 .